Space is brutally inhospitable to human life, so it's a small wonder that out of the 561 people who have ventured beyond the safety of Earth, only three have died there. Five times as many have perished due to crashes or explosions when rocketing away from our planet or re-entering its atmosphere. The three brave spacefarers who lost their lives in space were cosmonauts Georgy Dobrovolsky, Vladislav Volkov, and Viktor Patsayev. All three died on the Soyuz 11 mission of Jun 1971. 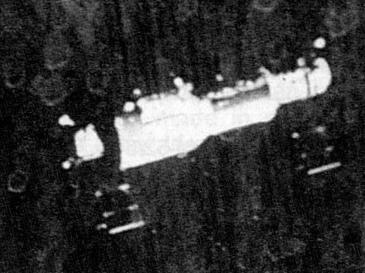 An extremely rare view of the world's first space station, the Soviet Salyut 1, as seen from the departing Soyuz 11. While Soyuz 11 ended in sadness, the vast majority of the mission progressed gloriously. Dobrovolsky, Volkov, and Patsayev lived aboard Russia's Salyut 1 Space Station, the very first space station, for twenty-three days, setting the record for the longest stay in outer space at the time. During their mission, the bold cosmonauts wowed Russians back on Earth with live television broadcasts, projecting hope and depicting a bright future. Patsayev also became the first man to operate a telescope in space. The spectrograms he produced of the stars Vega and Beta Centauri with the station's ultraviolet telescope were later published in the journal Nature. The fatal cabin depressurization occurred when a "breathing ventilation valve" located in the interface ring between the orbital module and the descent module opened inadvertently during the downward path of the descent vehicle... At approximately 723 seconds after retrofire, the 12 Soyuz pyro-cartridges fired simultaneously instead of sequentially to separate the two modules. The force of the discharge caused the internal mechanism of the pressure equalization valve to release a seal that was usually discarded pyrotechnically much later to adjust the cabin pressure automatically. When the valve opened at a height of 168 kilometers, the gradual but steady loss of pressure was fatal to the crew within about 30 seconds. By 935 seconds after retrofire, the cabin pressure had dropped to zero and remained there until 1,640 seconds when the pressure began to increase as the ship entered the upper reaches of the atmosphere. Russian space officials awaiting the return of the cosmonauts had no idea of their dire condition as the Soyuz 11 module settled onto solid ground after peacefully parachuting down from the sky. The re-entry had apparently gone off without a hitch; there was no reason to expect something was amiss. Opening the Soyuz hatch abruptly poisoned the celebratory atmosphere. Rescuers witnessed a grisly scene. "They found all three men in their couches, motionless, with dark-blue patches on their faces and trails of blood from their noses and ears," Kerim Kerimov recounted. Attempts at resuscitation failed. The men had almost certainly asphyxiated as their cabin air leaked out into space, replaced by a complete vacuum in which no human could survive for more than ninety seconds. They would have had no more than fifteen seconds to find and seal the gash in their wounded spacecraft before being rendered deaf and blind as their blood vessels burst due to the difference in pressure. Throughout Russia, the disaster brought about an unprecedented wave of mourning. People wept openly in the streets for three men who for over three weeks had appeared nightly on their television screens—cosmonauts who were being presented as human beings and not cold, faceless supermen—and who had offered a clear response to Apollo that the Soviet Union was back in the manned space business and firmly in the lead. Now, instead of three heroes, bearing broad smiles and bedecked in medals and garlands of flowers, all the Soviet people had was … three funerals. NASA officials were granted reports much sooner, and within a month they had conducted a complete review of the windows, hatches, valves, fittings, and wiring – anywhere that could leak – in the Apollo lunar and command modules. NASA and Roscosmos also started requiring astronauts to wear pressurized suits during additional mission phases, especially the descent.